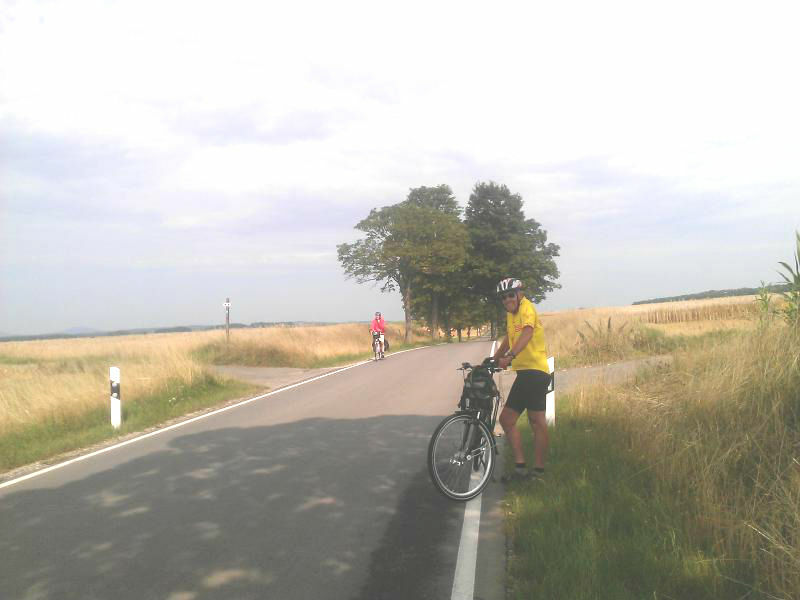 Our bike ride followed what is called the Werratal Radweg (Werra River valley bike route) which flows roughly South to North from the its two sources at Fehrenbach und Siegmundsburg in southern Thuriungia to where empties into the Wesser River near Hannoverish Münden in Lower Saxony. We went North to South starting in Wanfried and leaving the Werra a few miles southeast of Hildburghausen heading south to Coburg. I was under the impression that the Werratal is not one of the main long distance bike routes in Germany. But I'm not so certain now, based on the large number of touring cyclists we passed going in the opposite direction. 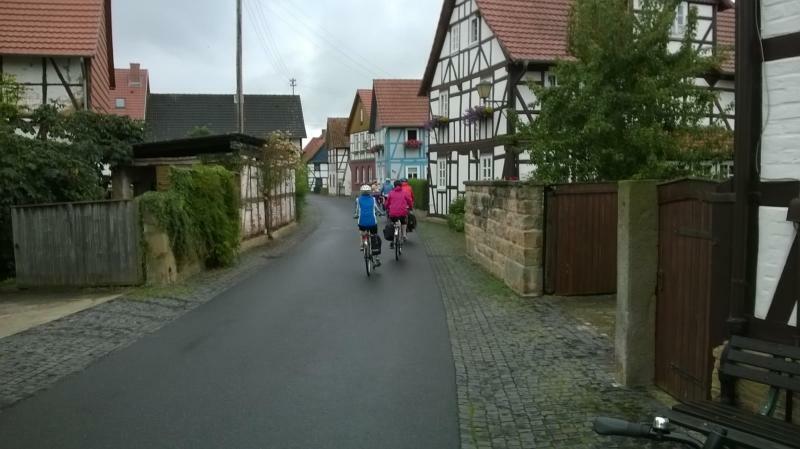 We loaded the bikes into a trailer that Jürgen had engaged and set out in the car for Wanfried, about 40 miles south of Obernfeld. A point of interest along the way was the border museum at the point where we crossed the border from Lower Saxony (former West Germany) to Thuringia (former East Germany). 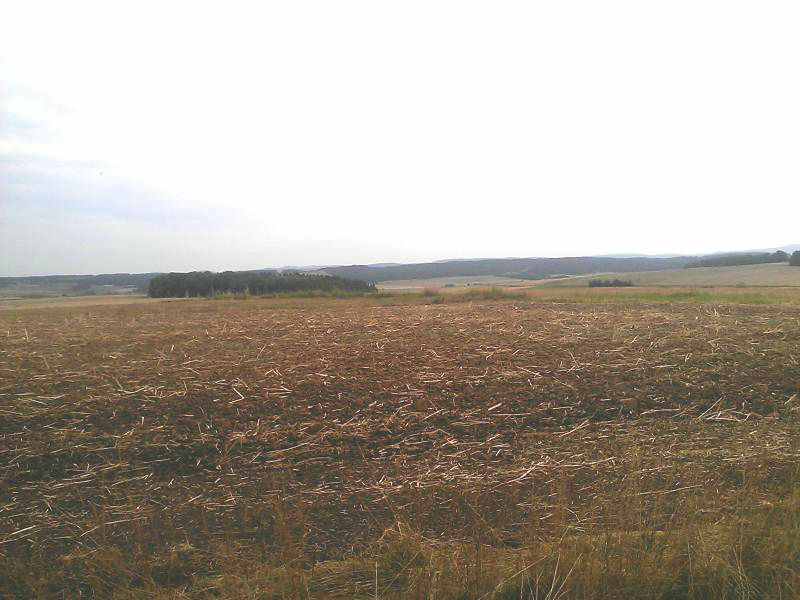 Just before reaching Wanfried, our starting point, we entered the province of Hesse in the former West. 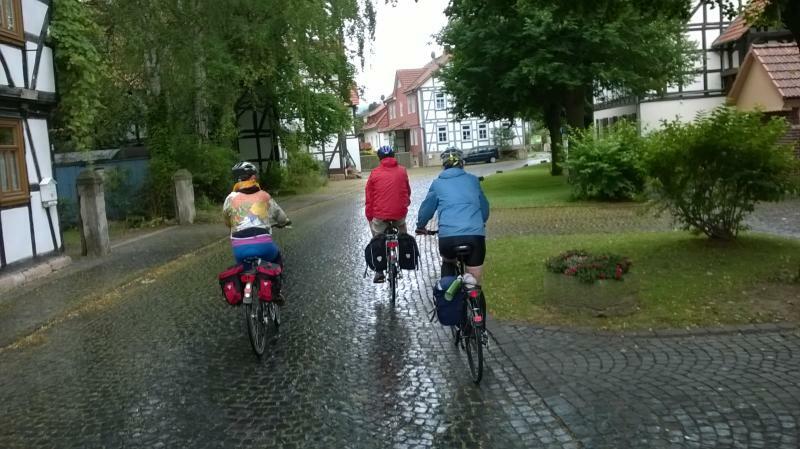 Not long after starting the ride, we crossed back into Thuringia and remained in the former East most of the time until just before the end when we entered Bavaria near Coburg. Around 11:00 AM we set out from Wanfried in a light rain, which soon let up. 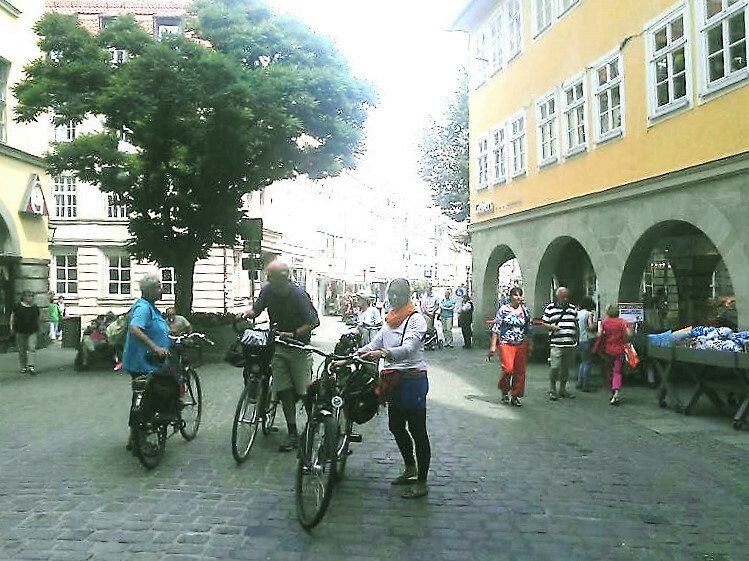 Here we see two common sights: half timber architecture and cobble stone streets, sidewalks, and bike lanes. 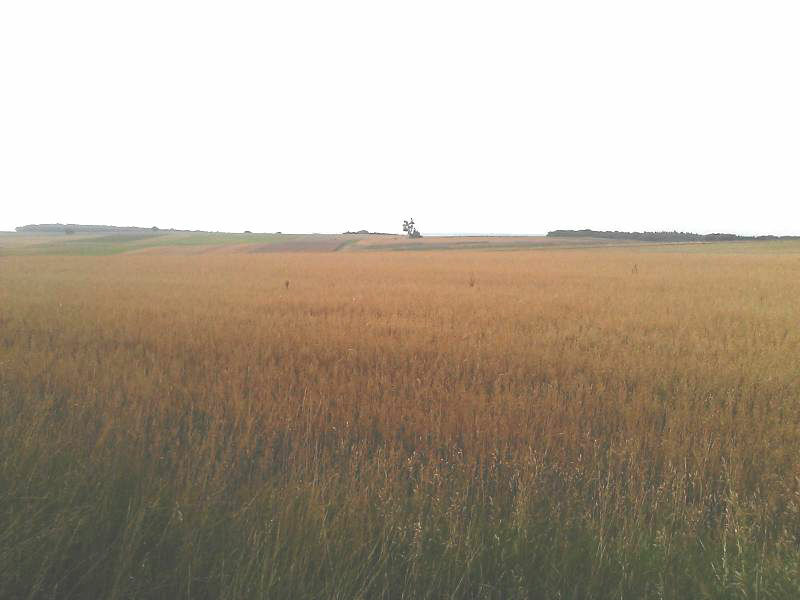 Another view of Wanfried. This was typical of the Weratal Radweg as it passed through towns. Elsewhere we found asphalt bike paths, even a former rail line for a short distance just outside Wanfried, gravel paths, one or two very rough, country road, some even gravel. Passing a camp ground. Fortunately, the first two days we were able to stay in the valley. In the middle of the afternoon we stopped for dinner at a typical small town restaurant in Creuzburg. I selected the Thüringer Zwiebel Rostbrätl, which apparently is a specialty of the area. But I couldn't decide on what type of fleisch it was. Wikapedia says is is a marinated cutlet of pig neck. Oh well, I liked it. I can't say the same for Janelle. She wanted fish and ordered lachs, which turned out to be thin, cold slices of what looked like lox. I don't know where the mixup came from; I thought lachs meant salmon in German. 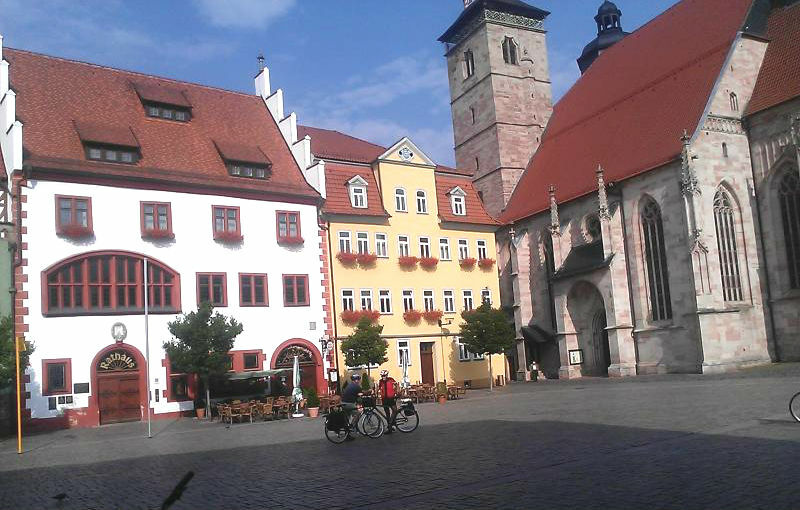 When Jürgen presented the itinerary, he included dinner each day at a town along the way. This was different than our usual custom of a small lunch around noon and then supper after we had settled in, showered, etc. But this turned out to be a good strategy. By the time we reached the dinner stop, I was dead tired and needed a good rest. Maybe it was the beer at lunch that killed the pain; but I seemed to revive. Then in the evening about all I wanted was some ice cream. That way I was ready for the big breakfasts; I didn't feel stuffed from the night before. 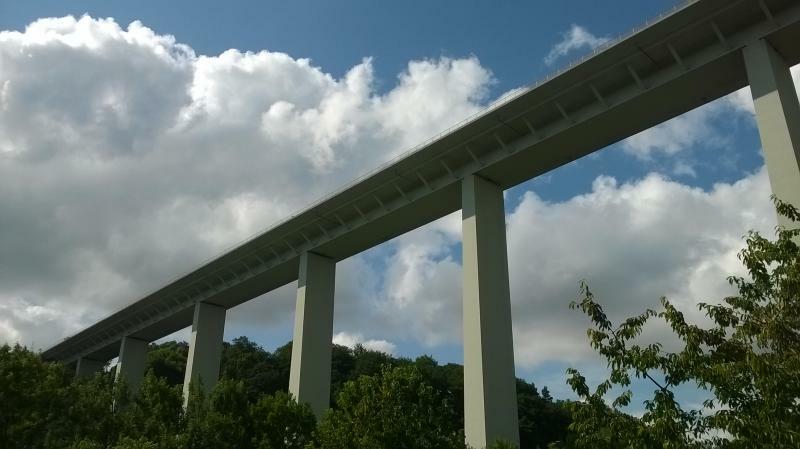 Passing under an autobahn a few miles past Creuzburg. We spent the night at a nice pension in Gertungen. 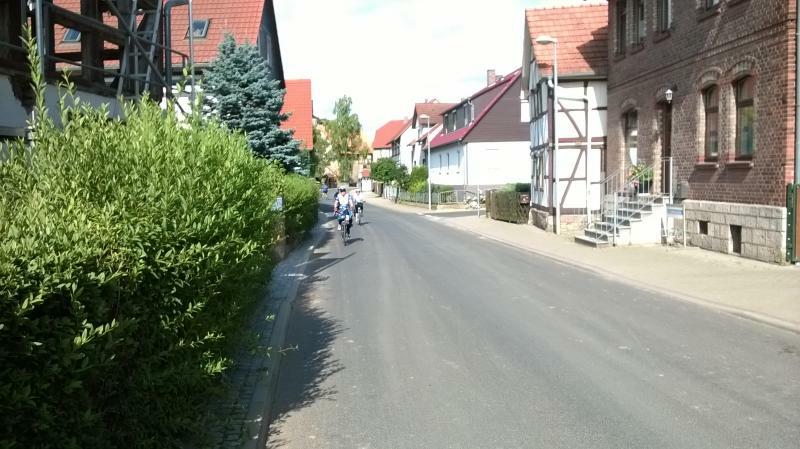 But its main attraction was it was very close to the bike route and there was a supermarkt nearby to get ice cream. 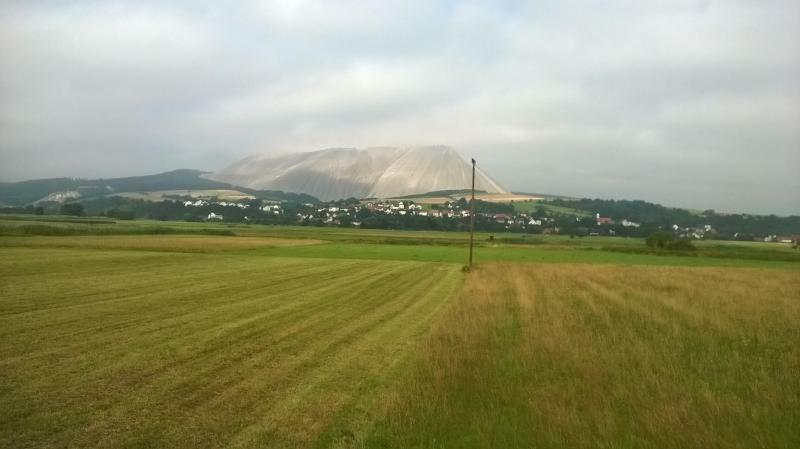 Salzberg (“Salt Mountain”) near Heringen. A by-product of the world’s biggest potash mining area. 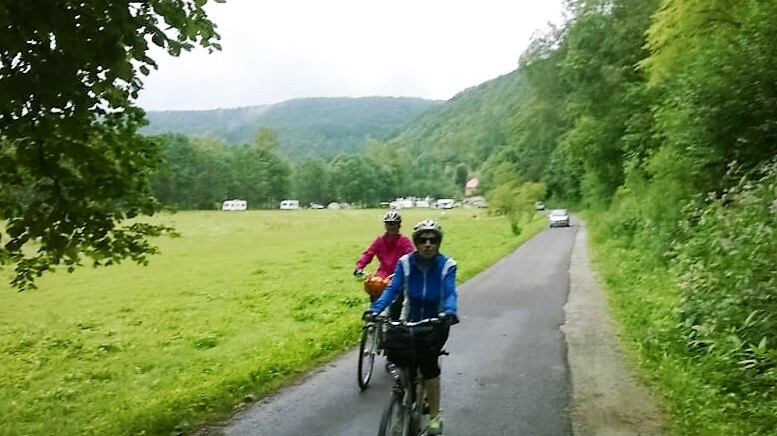 It had been threatening rain most of the day, but held off until we were approaching the outskirts of Schmalkalden about 3 miles from our hotel when we were hit by a heavy downpour. We were tired and wanted to get to our destination, so we pressed on. I had pulled out my windbreaker that I thought was water proof. But it didn't stand up to this amount of water; and I got soaked. Fortunately, I had packed my gear in plastic bags; and it remained dry. Our destination was a nice hotel in the old part of town; a hot bath in a bathtub was welcome. With the benefit of hindsight, we might not have spent the time at a typical small town fest in Barchfeld. It was unfortunate that tiredness after the long ride and heavy rain discouraged us from exploring the old part of town. It was a maze of narrow streets lined with half timbered buildings. We did get a couple of pictures on our way out the next morning. Here is the city hall. Today's mileage was about the same as yesterdays, but with the added benefit of hills. We decided to have dinner in the middle of the afternoon at a Landgasthof (country inn) on the outskirts of the small town of Bierieth. As we were waiting for our meal and then eating, we could see dark clouds forming to the SE, the direction we were heading. As we headed towards the darkness, we could see it moving ever so slowly towards the north. Despite passing large puddles and downed tree debris, we missed the rain by some miracle. It was about this time that we began experiencing long steep hills. Up until this point, we had been riding mostly in the valley; and despite the fact that we were going up stream, any gain in elevation was not noticeable. But now after each town, we climbed up out of the valley only to descend to the valley at the next town, and then repeat the pattern. We spent the night at a classic Gaststätte, combination restaurant, beer garden, and overnight accommodations. While Janelle and Jeanine went for a walk around town, I joined the rest on the deck outside for beer and ice cream. The first few miles was a repeat of yesterday - up and down, in and out of the river valley. Finally, we turned south out of the valley and began rolling through farm land. 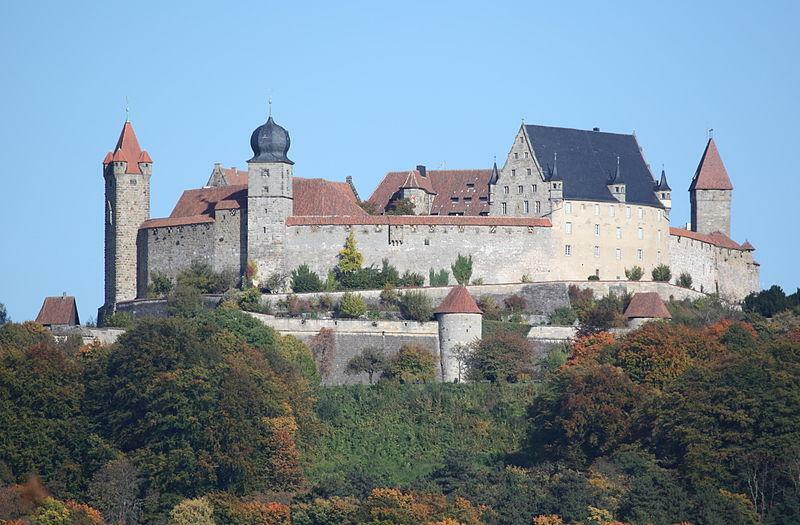 We could see Coburg Castle on a hill south of town long before we reached Coburg; but didn't climb the hill to visit it. Coburg is the only town on our tour that I had ever heard of because of its connection to the British royal family. The name was changed from Saxe-Coburg-Gotha to Windsor during the first world war. The closest train station to Obernfeld is Leinefelde. Taking advantage of much less expensive tickets that prohibit travel in ICE trains involved 5 separate regional expresses from Coburg, changing in Lichtenfels, Saalfeld, Arnstadt, and Neudietendorf. 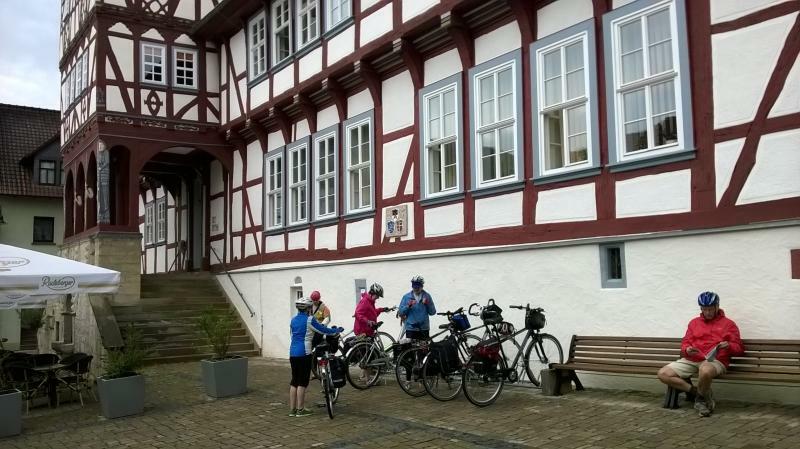 After having dinner in Coburg, since we had plenty of time, Jürgen and Marcia decided to continue biking to Lichtenfels while the rest took the train. I, of course, wanted to go with them; but since I was the only one left qualified to find the station, find the right train, hand the tickets to the conductor, and get off at the right place, I was pressed to service. When we reached Lichtenfels, while Jeanine, Janelle, and Becky explored the town, I headed towards the Basilica of the Fourteen Holy Helpers, a local attraction a few kilometers outside of town. Once I got out of town, the bike path started going slightly up hill. When I reached the spot where serious climbing was required, I gave up and turned around. Meanwhile, Jürgen and Marcia did make it up to the Basilica. Oh well! The train ride back turned into an adventure. First of all, the train from Lichtenfels to Saalfeld was about 15 minutes late; and we only had an 11 minute layover. Fortunately, Jürgen was able explain the situation to the conductor who called the next train's conductor and convinced him to wait for us. This was complicated by the fact that two train companies were involved. The later one belonged to Deutsche Bahn while the next one belonged to a local, probably owned by Thuringia. But it worked out. Then there was the transfers where you had only a few minutes to get from one platform, down the stairs to the underground tunnel, and up the stairs to the adjacent platform. We were used to this, having done it many times in Austria. But not with the heavy, European style city bikes. Except for Jürgen, it took two of us for each bike, one on the front and the other on the back.